To borrow a fast food phrase, this season you can really “have it your way.” Do you want to use deeper, darker hues, or enjoy the ethereal effects of a layered off-white interior? Both are possible if you can’t decide. Let’s say you’ve been eye-balling everything that pops up on social media feeds featuring navy blue or charcoal grey, but are afraid of being tied to that depth of hue. Do you think you might not want to live in so much darkness? Perhaps you’re imagining yourself coming into your home with the dreamy, creamy coolness and luxurious layers of off-whites and soft tans? That too is possible. In fact, you can do it all; it’s just a matter of balance – balance and a little smart strategy. The market certainly is offering endless options to consumers and providing tools making it easier to imagine via Pinterest, Instagram, and Twitter. Just yesterday, I opened my Instagram feed to see several posts from paint companies, design firms, and furniture companies featuring headlines like “dark walls are amazing, especially when paired with a pop of brushed gold and a lot of natural light.” Usually, when anything is trending upward, people can get stuck in a wait-and-see mode until they start to see the various ways it can be done and they find one that seems familiar and doable for their own home. When designing any category of flooring for upcoming trends, it goes without saying that we know quite well what colors homeowners are going to be drawn to and what they’ll be choosing for the new colors as they plan their updates. For me, it’s always fun to find a few surprises, and believe me, there are quite a few right now. One of the biggest surprises is that grey is still right in the mix. 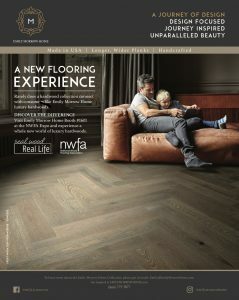 Seriously, since 2007 I’ve been pontificating about grey and eventually dealers started seeing the “value” of the color (if you’ll pardon the pun)…consumers were asking for it, and the dealers responded by buying pallets and rolls of grey flooring to fill consumers’ demand for something new, grey. Whether it’s the Color Marketing Group (CMG), Pantone, Elle Décor, or House Beautiful, fashion and interior designers, design editors, and homeowners are still loving grey. It is making gradual changes and is finding new ways of entering spaces, either by undertones of other colors or by partnering with vibrant hues or extremely light neutrals. But no doubt about it, grey is still strong. Personal expression is going to be driving the trends – while they seem to be going in every different direction, the personalized element is the common thread. My own home has always been the best petri dish for anything going on in design, and I’ll admit that my paint colors have been grey since 2006 or 2007, starting with my Revere Pewter at both my former and my current homes. From our current home’s front door, which is “Bear Creek”, to our living room and keeping room, which are “Wrought Iron” and “Chelsea Grey”. What I love about grey is what the rest of the world loves about grey: it is so easy and looks smart. Whether your metallic finishes are oil-rubbed bronze, nickel, or the newest brushed gold, grey simply works. I know we will reach a day when we are ready to pitch it all out for something that is inconceivable today. I do remember when grey felt old and tired and we were drawn to warm colors like Hepplewhite Ivory and Adams Gold, circa the 1990s. Emily Morrow Home Hardwood style “REFINED SIDE” contrasts nicely with the crisp white cabinets and walls. 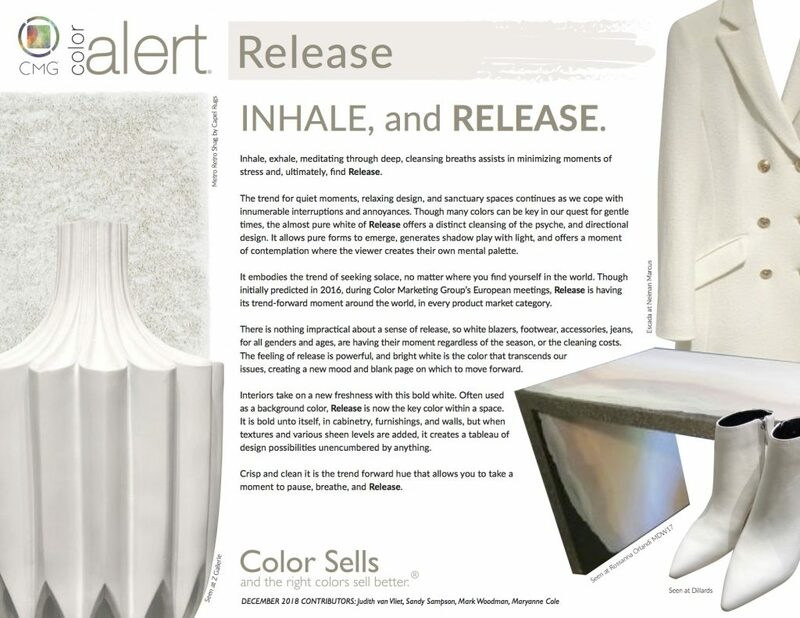 I think the best way to encapsulate our new color trends discussion is to start at the end of 2018, where we began to see and feel “Inhale” and “Release” from CMG, a creamy white associated with deep meditative cleansing breaths to minimize stress as well as open up smaller spaces, visually expanding them. Who wouldn’t love that? White isn’t the only option for a small space. Then we turned the calendar page and leapt right into 2019 and discovered a new grey, City Grey, an internationally acclaimed dark neutral that is very dark, 70 percent black. Darker shades can play up the size and make it feel cozier. Dark colors blend and blur lines and corners much the same way they do in fashion and flatter practically everything that surrounds it. 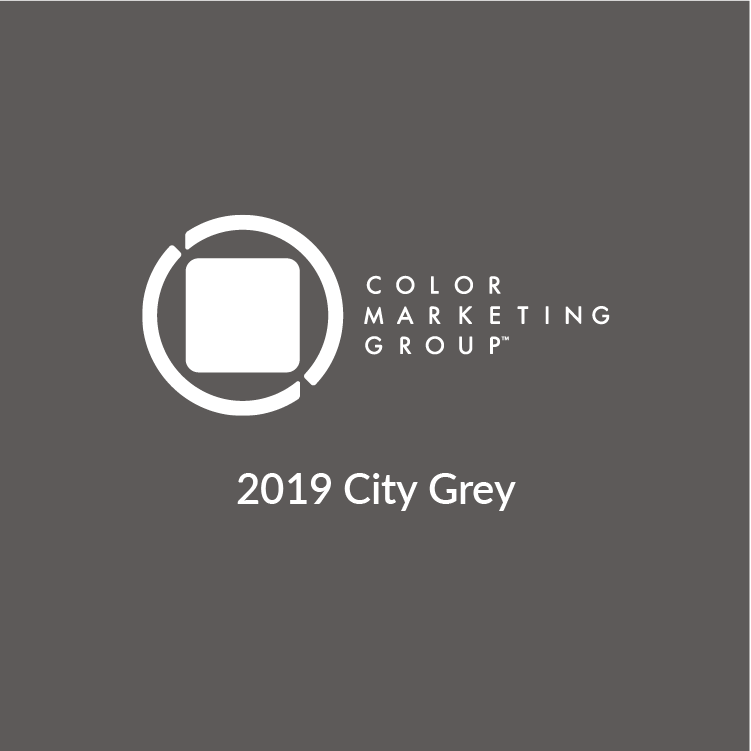 While we may have felt the “ahhhh” of the “Inhale and Release” in December, that was just to get us through the end of the year and ease us into the urban vibe and faster pace of 2019 with City Grey. What’s new about this grey, you may ask? This has a little sheen to its finish, unlike the matte and muted greys. We are finding these greys influencing our other colors in the trends list. For example, our deep green certainly is deepened by black, and greyed pastels are tinted by lightening it with the addition of white. According to CMG Contributors Judith van Vliet, Sandy Sampson, Mark Woodman, and Maryanne Cole, “Urban and urbane, City Grey is the look of color modernity. Originally emanating from CMG’s Asia Pacific 2017 color forecasts for 2019, its appeal is international, and its applications seemingly endless. “Strong, decisive, and influential, City Grey is appealing as a neutral color that is anything but neutral. Its depth defines its bold stance, its contemporary attitude, and its decisive industrial edge. It connotes the foundation of the urban landscape, the hushed night as it falls over a city, and the fortitude of a cityscape. Overall, when you turn the pages of shelter magazines in the coming months, you’ll see deep, dark, not gloomy, but certainly dramatically dark receding walls, and mid-value darkish flooring accented with large-scale patterns in various pops of color in accessories. The deep greens we are seeing are akin to the hunter and pine greens of the late 1980s, as are the inky navy blues. The combination of the navy blue, hunter green, and a swath of black make Black Watch Plaid, which has made its presence known across various categories from runway fashion to interiors. Ralph Lauren elevates this trend well with the Black Watch Plaids from RL Home and RL Mens and Womenswear, as does Barbour for men, women, the home, and pets. What does our industry do with this type of information? For starters, this information is applicable to your graphics, your logo, your brand imaging, and even your room scenes. And don’t forget that your retail and digital presence should reflect that you not only know the design trends but also know how to pair them with flooring. Your team should also be well-versed in the design and color trends so that they too can reflect your company well. 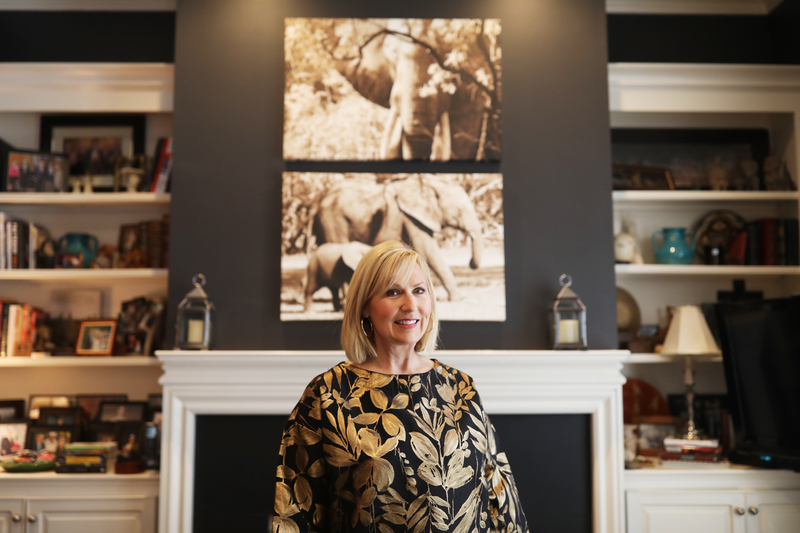 Emily Morrow Finkell is an interior designer and CEO of EF Floors & Design LLC in Dalton, Georgia, a provider of hardwood floors and home furnishings, and NWFA design contributor. She can be reached at info@emilymorrowhome.com.